This project aims to reveal the possible impacts of anthropogenic activities (such as the agricultural irrigation, land use and land cover change, aerosols, etc.) on the regional climate and the feedback mechanisms behind. For instance, significant water vapor export from the agricultural irrigation exploitation could change the local water/energy balance and regional atmospheric circulation. 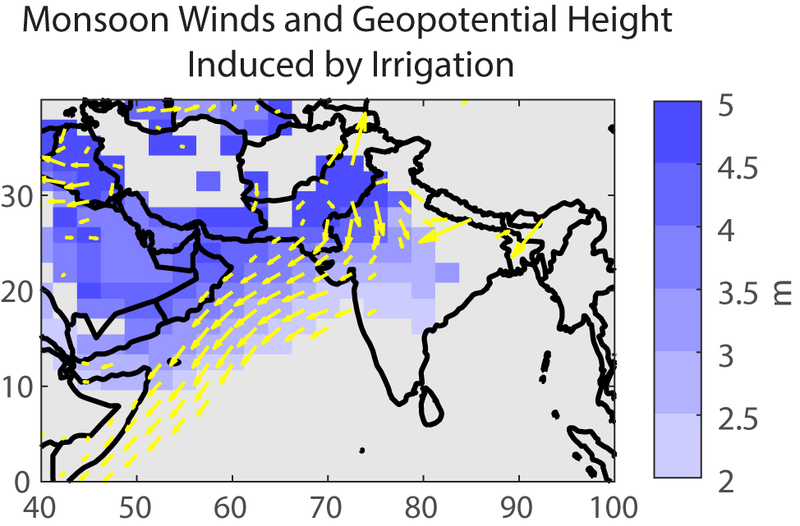 India experienced the agricultural irrigation development from the 1950s, and there was an observed reduction of Indian Summer Monsoon Rainfall during the second half of twentieth century. 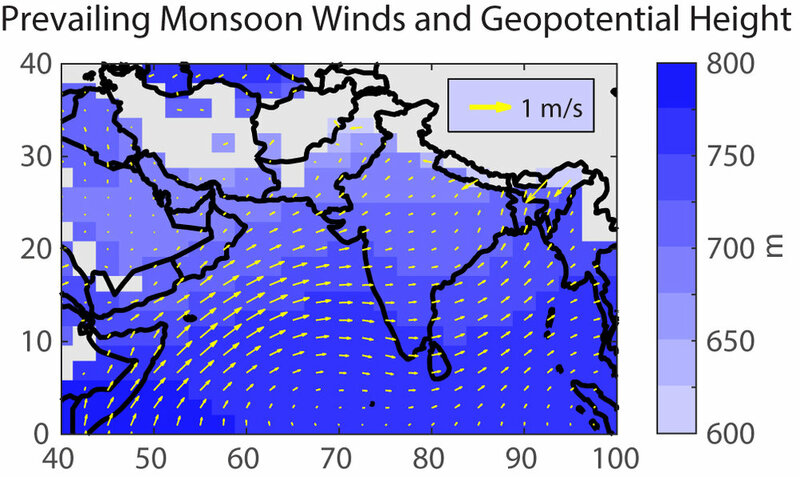 So far, what we found is that the agricultural irrigation weakened the Indian Summer Monsoon winds (see the figure) and reduced rainfall with the high temporal and spatial variabilities. Now we are looking at the influences of other anthropogenic activities on the regional climate and the interactions among them. Freshwater scarcity and unsustainable water use is a growing concern in many developing countries including India. Increasing water demand coupled with rainfall variability associated with climate change exacerbates water scarcity. The increase in water demand is attributed to population and economic growth as well as technological change, and the gap between the actual water available and the demand continues to widen. This study aims to develop a large-scale assessment model of sustainable water use in India during the period 1970 - 2010 at a spatial resolution of 50 km x 50 km and a temporal resolution of monthly timescale. A Community Land Model CLM 4.0, developed by the National Centre for Atmospheric Research (NCAR) of the US, and census-based statistical database are used in this study to quantify and assess the sustainable water use in India. We define the measure of sustainable water use as the difference between the total water available and the total water demand. For each grid cell, the total water available is modelled as the sum of surface runoff and groundwater. The total water demand is estimated as the sum of irrigation, industrial, domestic and environmental water demand in each grid cell. Among the demands, the irrigation water demand is modelled based on census data sets of irrigated areas and irrigation water withdrawal while the domestic and industrial water demand is modelled as a function of population, economic and technological indicators such as gross domestic product, electricity, fuel consumption and industrial outputs.